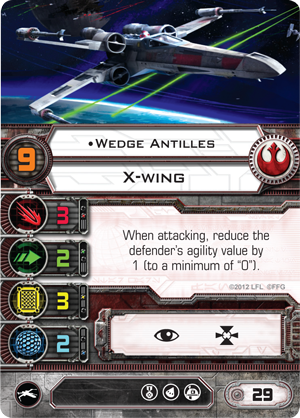 X-Wing Wave XII (consisting of the Alpha-class Star Wing, the M12-L Kimogila Fighter, and the Phantom II) and Wave XIII (consisting of the Resistance Bomber and the TIE silencer) were originally announced as separate waves. Fortunately, we have been able to move our release dates to release all five ships simultaneously! You can pre-order all five ships by clicking on the products shown to the right. 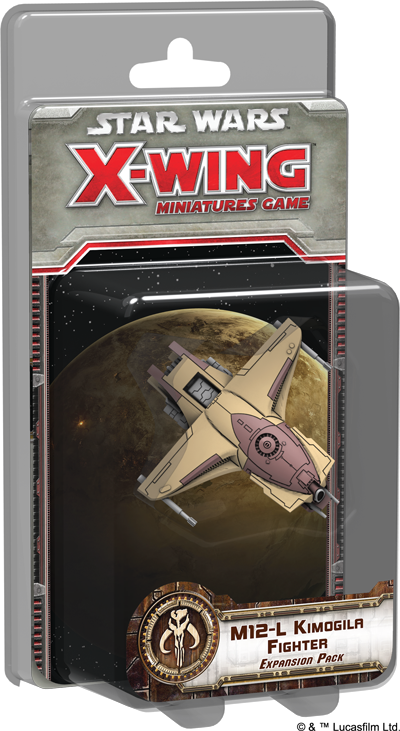 Each of the new X-Wing™ ships from Wave XII offers its faction something new. 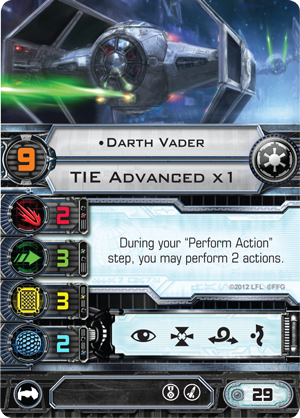 In our last preview, we saw how the Alpha-class Star Wing provides the Galactic Empire a novel take on both the SLAM action and the fighter's new reload action. 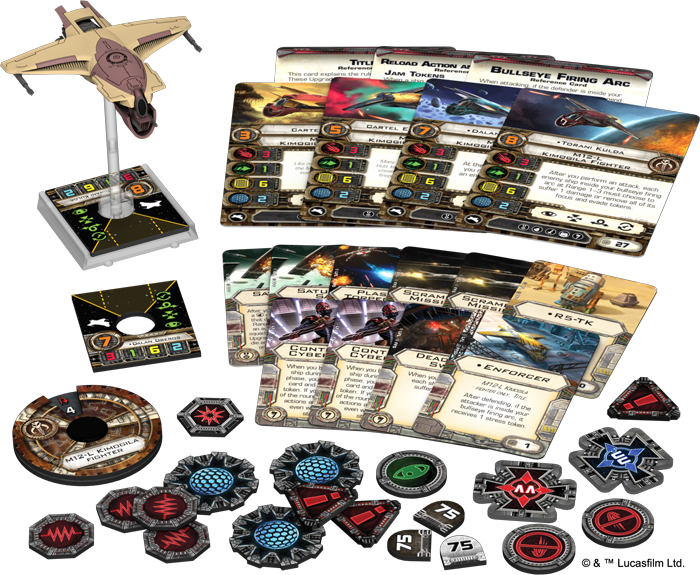 Although taking either of these actions saddles a ship with a weapons disabled token, the Star Wing comes with a number of upgrades and pilot abilities that don't just offer its pilots ways to perform attacks while encumbered with weapons disabled tokens, but provide substantial benefit from these tokens. And as a result, the Star Wing successfully incorporates the SLAM and reload actions into the core of its design. 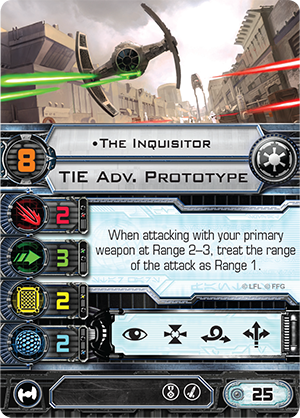 Meanwhile, the Phantom II Expansion Pack introduces the coordinate action to the Rebel faction, but we'll read more about this in a future preview. 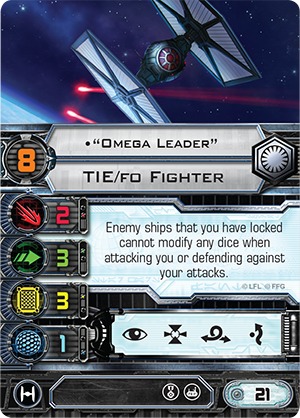 For now, we turn our attention to the Scum faction's M12-L Kimogila fighter—the heavy, straight-forward fighter that introduces the bullseye firing arc to X-Wing. Designed by MandalMotors, the M12-L Kimogila fighter was popular among the Hutts and free mercenaries due to the flexibility afforded it by its wide range of possible weapons configurations. This featured multiple gun emplacements and the ability to also equip torpedoes, meaning that it could function even as a bomber in some circumstances. While the M12-L Kimogila fighter's pilots would often find themselves outclassed in speed and maneuverability, they typically overlooked these concerns, favoring instead the Kimogila's potential for wanton destruction. 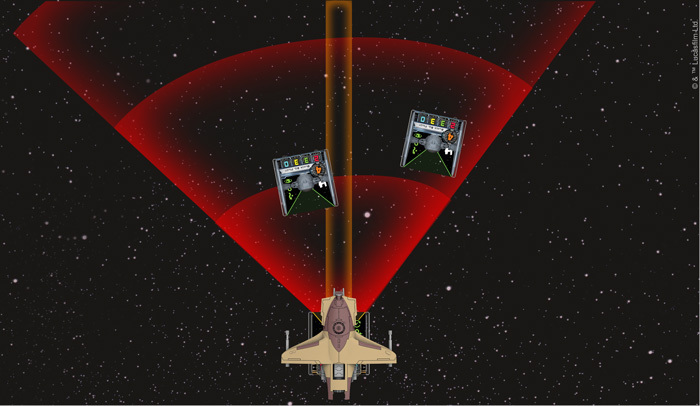 In X-Wing, all this wanton destruction tracks back to the ship's signature bullseye firing arc . A narrow firing arc within the ship's larger firing arc, the bullseye firing arc aims from between the guide pegs on the ship's base and extends to Range "3." The TIE fighter on the left is within the Kimogila's bullseye firing arc. The TIE on the right is within the Kimogila's standard arc, but outside of its bullseye firing arc. Given how difficult it can be to catch one of your opponent's more slippery ships even within your standard firing arc, catching your opponent within the bullseye firing arc will certainly prove a challenge from time to time. But when you succeed, it pays off—with the thunderous eruption of your opponent's shields and hull! 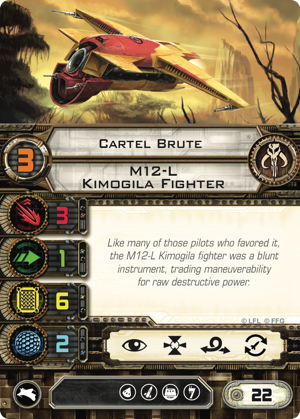 Any ship that the M12-L Kimogila fighter catches in its bullseye firing arc is denied the ability to spend focus tokens or evade tokens to modify the results of its defense dice. Immediately, this adds tremendous value to all the hit and critical hit results that the Kimogila's attacks may generate, lending even the lowliest of the Kimogila's pilots an edge to their attacks that rivals those of "Omega Leader," The Inquisitor , and Wedge Antilles . 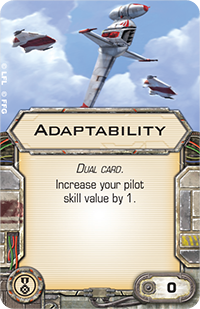 Like these top aces, the Kimogila's pilots are able to manipulate the odds of attack dice versus defense dice to their favor. Of course, the more talented Kimogila pilots are able to take even greater advantage of the ship's powerful bullseye firing arc. A 360-degree view of the M12-L Kimogila fighter. One might presume that the pilots who favor the M12-L Kimogila fighter do so because they're more comfortable with big guns than they are with a vessel that responds to their skills, and to some extent that presumption might be accurate. Your basic Cartel Brute , for example, won't be able to dance around a battlefield in any protracted duel with a pilot like Darth Vader or Poe Dameron , but he might still hit hard with the one or two or three good shots he fires. But the Kimogila's other pilots aren't all such blunt instruments. They might not rely so heavily upon the ship's six hull and two shields. They might, instead, prefer the ship for what it offers them when they do line up their shots, catching their foes square in the bullseye. For example, when Dalan Oberos catches his foes in his bullseye firing arc, he doesn't just deny them the defensive benefits of their focus and evade tokens; he gains a free target lock. Dalan Oberos performs a barrel roll to catch Miranda Doni at Range "1" and gain a free target lock. A notorious bounty hunter who first appeared in the Chronicles of the Gatekeeper adventure book for the Star Wars™: Force and Destiny™ roleplaying game, Dalan Oberos was rumored to have met his demise during a job gone bad on Cato Neimoidia. But he has now resurfaced as a freelance enforcer for the Hutt Cartels and other operations in the Outer Rim. Some say he has come back changed or disfigured, armed with Contraband Cybernetics and a new view on life. Others have whispered that the bounty hunter calling himself Dalan Oberos is not the same man who fell on Cato Neimoidia. 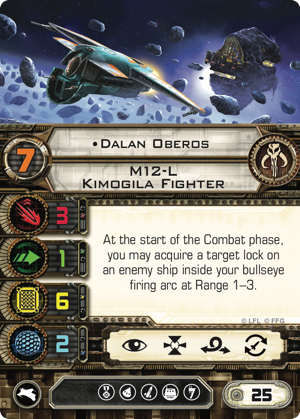 No matter how it is he returned, though, no one can deny how dangerous Dalan Oberos truly is when he's behind the controls of his Kimogila fighter. 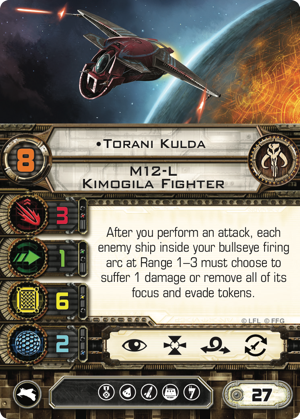 Just as deadly—although likely far trickier to fly—is the M12-L Kimogila's other ace pilot, Torani Kulda . A Rodian bounty hunter and assassin who first came to our attention in the Lords of Nal Hutta sourcebook for Star Wars™: Edge of the Empire™, Torani Kulda rewards you tremendously any time you maneuver her into position to catch multiple foes in her bullseye firing arc. Given how difficult it can be to catch enemy ships in your bullseye firing arc, especially when you consider that all of the Kimogila's Speed "1" and "2" turns are red, catching multiple ships in the same firing arc will be no easy task. That said, if you manage it, Torani Kulda will force them all to either discard all of their focus and evade tokens or suffer one point of damage. 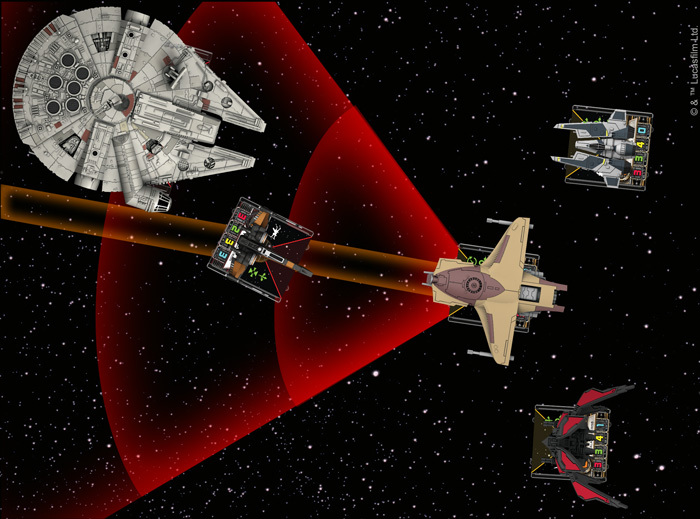 Torani Kulda performs a barrel roll to catch a whole line of Imperial TIE fighters in her bullseye firing arc. 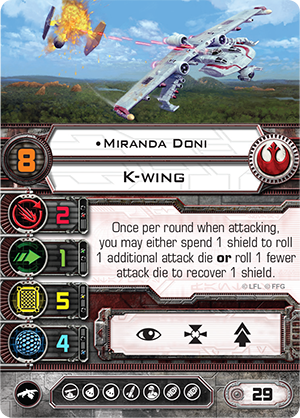 Fortunately, Torani Kulda's pilot skill value of "8" allows her to maneuver and use her barrel roll to adjust her position after most other ships will have already settled into place for the round. 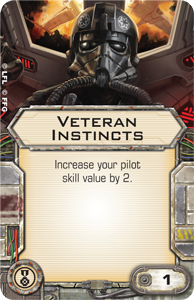 And you can improve her ability to respond to other pilots' maneuvering by equipping her with either Veteran Instincts or Adaptability . "After defending, if the attacker is inside your bullseye firing arc, it receives 1 stress token." This ability won't help you find any additional evade results, nor will it reduce your opponent's attack accuracy. 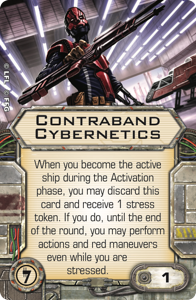 But the threat of a stress token—one that can stack with any existing stress tokens—might just encourage your opponent to fire at one of your other ships. A stress token taken at the wrong time could force a ship to fly off the board or to spend multiple rounds repositioning in order to get your fighters back in arc. 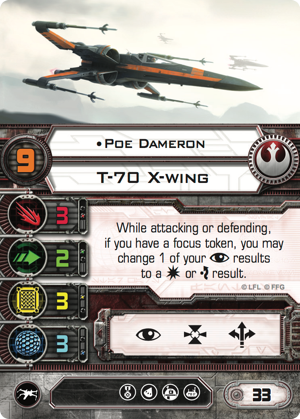 If Poe Dameron takes his shot at Torani Kulda's Enforcer, he won't be able to complete the Koiogran-turn or Tallon Roll he had planned to perform in the subsequent round. 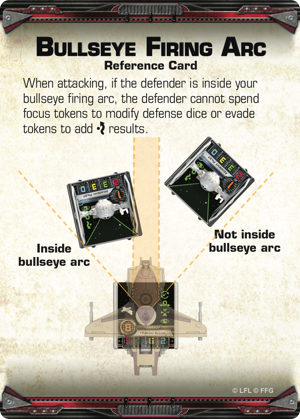 As a result, your opponent might refuse to fire at the Enforcer if there's another target available, even if that target might have greater agility or a more resilient combination of shields and hull. And there's no better defense than not getting shot at! 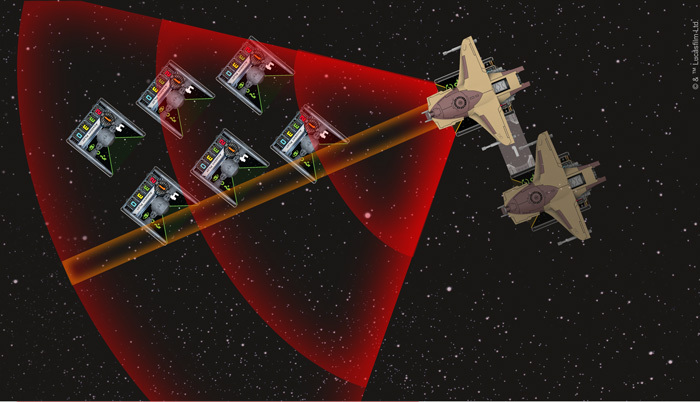 No matter if your firing arc is ninety degrees, 180, or 360, you still need to outmaneuver your foes if you want to win your X-Wing battles. With the M12-L Kimogila Fighter Expansion Pack, this fact is further reinforced and stamped with an exclamation mark by the ship's bullseye firing arc. Are you skilled enough to catch your foes dead to rights? 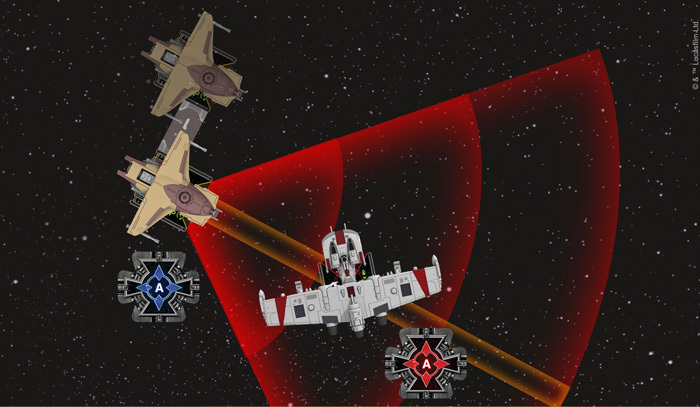 Are you brave enough to fly at your enemy's ships and dare them to scatter to either side of your formation? The Kimogila fighter and its bullseye firing arc raise the importance of your maneuvers to all-new heights, so how will you fly it? Share your thoughts with the other members of our community forums. 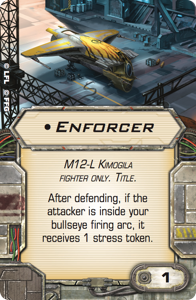 Then pre-order your copy of the M12-L Kimogila Fighter Expansion Pack (SWX70) at your local retailer or online through our website!